Since Mrs Watcher is out of town visiting relatives, I will be alone by the campfire tonight pondering the prophetic possibilities of September and October of this year whilst waiting, watching and weeping for Zion as the feast of Trumpets is upon us. I plan on having lots of these “Zion Watch” sessions during the next two months. Will I be watching and weeping for Zion alone or will you be joining me in whatever part of the vineyard you find yourself in? Although the above dates are found in a post on the internet, I have found conflicting interpretations as to whether the feast actually begins on the 8th, 9th or 10th… and then of course, there is always the ominous date of September 11th which is rooted deeply in LDS historicity and other historical events not the least of which are a) the date section 64 was given, b) the date Zion was to be redeemed by, in the 2nd watch, c) the Mountain meadows Massacre and d) the 9/11 attach of the twin towers in 2001.. But let us also not forget the significance of the two following feasts in this month and October, Yom Kippur, the Day of Atonement (10 Tishri) and Sukkot or “Booths” the feast of Tabernacles. And lastly, let us not forget the ongoing, annual prophetic significance of September 22nd… more on that later. This will be my third and final post having to do with, among other things, the curse that Malachi, Isaiah and other ancient prophets spoke about that I believe is associated with the global calamity mentioned in section one of the D&C and which I also believe is related to the current crisis in the gulf of Mexico. This could be long winded so pop some corn, heat up the hot chocolate, stoke the fire and make yourself comfortable. We live in one of the most remarkable prophetic times in the history of the world. I believe we are not only living in the last generation spoken of by Christ in Matthew 24, but more specifically, I think we have already entered into a major seven year prophetic time sequence of the last days. Now that most of the masses have been lulled back to sleep by the mainstream media and are under the delusion that the gulf crisis has been or is currently being resolved, this nation is set up for the great calamity mentioned in section 1 of the Doctrine and Covenant. You will recall that I quoted from and provided videos of Matthew Simmons warning about the gulf crisis in my last post. Since then, he has died, supposedly of a heart attack ( see also this link. And also in a related topic, it is now legal for the President to have American citizens assassinated if he deems it necessary. Those of us who are tuned into alternative medias, realize that the PTB would not have orchestrated the death of Brother Matt Simmons if there was not some truth to the voice of warning that he gave concerning the desolating sickness that is in the process of coming out of the gulf. My condolences to the family of Brother Simmons for his untimely death on August 8 2010. Matt was a prominent of peak oil and an advocate of the policies of the Club of Rome. Although he was part of the global elite, very good friends with the Bush family, having served as he served as energy adviser to U.S. President George W. Bush and was a member of the council on foreign relations, he was, nevertheless sounding the warning voice about the seriousness of the situation in the gulf. ordered to assassinate brother Simmons. It is believed that Gareth had returned to London on August 11th from the United States on a flight from Boston a little less than 36 hours after Simmons was believed to have been “murdered” in his Maine vacation home. Gareth’s body was discovered murdered and stuffed into a sports bag in the bathtub of his flat on August 23rd. Some believe that Gareth was dispatched to his next assignment in the dark regions of the abyss by his counterparts from the CIA or the NSA for the deed he had done to Simmons. Apparently the PTB were not in harmony as to whether Simmons should be silenced or not about the horrendous transgressions of BP and the serious threat to our health the gulf has become. When secret societies are having their spy agencies assassinate members of other spy agencies controlled by sister societies, it is certainly a sign that Satan’s kingdom is divided. The book of Mormon prophesies that at the time that the Lord God proceeds to make bare his arm in the eyes of all the nations, in bringing about his covenants and his gospel unto those who are of the house of Israel and begins to gather together his people out of obscurity and darkness for the final time, that the whore of all the earth would begin to war among themselves. Although the literal fulfillment of the above prophecy is yet a future event, the contention and division among Satan’s minions is increasing. The long term effects of the gulf stream upon the bloodstream are as yet unknown to the majority of the sleeping American people. The media cover up of this amazing global crisis is not limited to the news media, ecosystem biologist Linda Hooper-Bui describes how Obama administration and BP lawyers are making independent scientific analysis of the Gulf region an impossibility. Other articles of interest may be found here. One of the fascinating curiosities of the LDS foundation movement is how Moroni met with Joseph Smith year after year on September 22nd despite the fact that that particular date did not always fall mark the feast of trumpets in following years. I pose this question because the Marvelous Work and a Wonder is in fact a continuation or outgrowth of the “foundation of the Marvelous Work” that was laid in the 1800’s. The point I am making is that even though the dispensation of the last times is not synonymous with the dispensation of the fullness of times, it contains it. It continues on even when the fulness of times comes in. It is therefore not inconceivable that the feast of Trumpets trigger point was fulfilled during the foundation movement and the birthing of the fullness of times could be marked by the annual marker of September 22nd as noted and kept by Moroni. Just a possibility… something to ponder. As you know, Joseph Smith received the golden plates on the Israelite Day of Remembrance called Rosh ha-Shanah. Known as the Feast of Trumpets which is followed in quick succession by the Day of Atonement and the Feast of Tabernacles. For context of what I am going to speak about in this post I want to provide a brief summary of what the feast of trumpets represents and its interrelationship with the coming forth and translation of the unsealed portion of the golden plates during the start of the LDS foundation movement as well as its interrelationship with the coming forth of the rest of the ancient records when the Marvelous Work and a Wonder begins. The first appearance of Moroni to the prophet Joseph occurred on the evening of September 21-22 1823 and Moroni’s visit was repeated every following year until the plates were received in September of 1827. But did you know that after the prophet Joseph sinned by allowing Martin Harris to take some of the translation manuscript, the plates were taken from him for a time and the angel Moroni told Joseph that he would not get them back until September 22 1828? “On leaving you, said Joseph, I returned immediately home. Soon after my arrival I commenced humbling myself in mighty prayer before the Lord, and, as I was pouring out my soul in supplication to God, that if possible I might obtain mercy at his hands and be forgiven of all that I had done contrary to his will, an angel stood before me, and answered me saying, that I had sinned in delivering the manuscript into the hands of a wicked man, and , as I had ventured to become responsible for his faithfulness, I would of necessity have to suffer the consequence of his indiscretion, and I must now give up the Urim and Thummim into his (the angels) hands. I find this truly amazing. Even the return of the Urim and Thummin for the purpose of resuming the work of translation, six years after the first visit from the angel Moroni had to take place on the annual date which began on a holy Jewish feast day. It has been observed that the day on which the angel Moroni delivered the plates to Joseph Smith, Sat 22 Sep 1827, occurred on the Hebrew Feast of Trumpets, also called Rosh Hashanah (1 Tishri). That timing seems significant because of the symbolism. According to Hebrew tradition, trumpets is the annual Judgment Day on which God judges each person for deeds of the last year and current state of righteousness. It is a day of warning and calling to repentance, because one then has nine days to repent before the judgment is finalized on Yom Kippur, the Day of Atonement (10 Tishri) which is followed by Sukkot or “Booths” the feast of Tabernacles. I love seeing the signature of God in the exactness of his date sequences pertaining to his dealings with his people. We know of events that took place on every annual date except the fifth year and also the midpoint date. I have not taken the time to research these dates yet. Is it possible that another seven year sequence follows that one? In section 29, given September of 1830, the Lord warns Joseph to “remember to sin no more, lest perils shall come upon you“. Sure enough, seven years later in September of 1837 Joseph and his brethren find themselves in peril as a result of the failed Kirtland Safety Society. They are forced to flee Kirtland for their safety, ending the Kirtland era of the church and beginning the Far West era. Of course, significant events undoubtedly continued to happen each year during the course of the 2nd seven year cycle and possibly on the 3 ½ year midpoint as well. I haven’t taken the time to research and document each of those dates either, although we have already reviewed, in previous posts, some of the significant events that happened on or within a week or two of these prophetic trigger dates, including section 84 which is also addressed to seven elders, just as section 29 was. It also promises them that God will use them to topple Babylon. So… If indeed a second seven year prophetic cycle followed the first one, is it possible that a third set followed the second? What exactly happens seven years from the end of the 3nd seven year cycle? If we go seven years from the perilous flight from Kirtland, it takes us to just a few months after the martyrdom and into the middle of the succession debate. Although I have not taken the time to research this final date and many of the other ones contained in the seven year period, it may be possible that the “set time” when the temple needed to be completed before the church was rejected with their dead was on that date, bringing the ominous warning of God contained in section 124 into fulfillment. Again, I have not done any extensive research to see what I can dig up on the sequence of trigger dates that take place between during this seven year period not can I provide hard documentation to prove that the climax of the seven year period does in fact fall on the acceptable time by which the temple was to be complete. I am simply looking for trends and types and making speculations. Again, I don’t know for sure what is significant about the trigger date of September 22nd 1844 but I have a hunch it marked the completion of the SUFFICIENT TIME that God gave the Saints to build the temple. You will recall that the Lord announce to the Saints that the fullness of the priesthood had been lost and he gave them a mandate to build a temple with a baptismal font for doing baptisms for the dead that would make possible the restoration of the fullness of the priesthood. He also gave them a warning to build the temple within a certain predetermined time, during which baptisms for the dead outside of the temple would be allowed and said that the consequences of not doing building the temple within the sufficient time would result in the saints being rejected as a church with their dead. “…build a house to my name, for the Most High to dwell therein. If the temple was not finished within a SUFFICIENT TIME, THE CHURCH WOULD BE REJECTED WITH ITS DEAD! I am going to suggest that the SUFFICIENT TIME period mentioned by the Lord in section 124 ended on the trigger date of September 22 1844. I believe that is when the “Acceptable Time of the Lord” would have been announced by Rigdon had the Saints repented and obeyed the commandments. It is when the MARVELOUS WORK AND A WONDER and the DISPENSATION OF THE FULNESS OF TIMES was to officially begin. That would make perfect sense for that third seven year sequence to end at the opening of the Marvelous Work and a Wonder, subject to the completion of the temple… when additional records were to come forth and the proclamation would go forth to the kings and authorities of the earth, setting the stage for things..
Now I realize that this contradicts what Lyman Wight said. He said that the sufficient time ended in October of 1841 when Joseph Smith announced that the Lord would no longer accept baptisms for the dead outside of the temple. HOWEVER let me explain why I think there is some confusion on this point. First, lets look at the historical record from the official history of the church. As shown from the revelation, the Lord had said that baptisms for the dead would be allowed outside until the sufficient time for the temple to be completed was finished. Ok… I realize it looks rather ominous and it could imply that the sufficient time had elapsed. The Lord states very clearly in section 124, in January 19 1841 that baptisms for the dead can only be done outside the temple until it is completed… then, in a public sermon Joseph Smith says “thus saith the Lord…” the Lord will no longer accept baptisms for the dead until the they can be performed in the temple. That certainly looks as if the Saints had failed to complete the temple within the SUFFICIENT TIME that the Lord had allotted. Lyman Wight made the observation in a letter he wrote in 1851, several years after the martyrdom, as he was looking back retrospectively to try and figure out when things came to an end. While I agree with Lyman that the refusal by the Lord to accept baptisms for the dead is an ominous omen that potentially implies that God was not happy with the Saints and possibly and an alienation between the Saints and God, I am not sure about his assumption that the predetermined time period for the completion of the temple had fully lapsed. Here are the reasons I partially disagree with Lyman’s assessment of the situation. First of all, Joseph Smith continued to admonish the Saints to keep working on the temple which they did, however leisurely, up until his death. If the Lord had revealed to Joseph that the Saints could no longer perform baptisms for the dead, would he have not revealed that they had been rejected with their dead and to stop working on the temple altogether in the same revelation? And would it not be announced in the same sermon? It seems inconsistent for the prophet to stop the baptisms and yet continue to admonish the Saints to build the temple if they had been completely rejected. Clearly Joseph and the Saints were still taking the warning from God seriously and were concerned about it. Joseph was clearly still admonishing the Saints to continue on the temple long after he informed them that their baptisms for the dead in the river were not longer acceptable. Secondly, The laying of the cornerstone for the temple did not even take place until April 6th 1841. That means that they had only been working on the temple about six months until the ominous declaration from the Lord took place. I don’t hardly think that 6 months is a reasonable or sufficient time period in which to build such an edifice. I find it extremely hard to believe that the Lord in his generosity and mercy would only give them six months time to accomplish such a task. It took three years to build the Kirtland Temple and seven years for Solomon to build that temple! Obviously, the church membership was much smaller in Kirtland, but that temple was not as big a project as the Nauvoo Temple. Keep in mind also that Joseph had let the Saints know that both the temple and the Nauvoo House had to BOTH be finished expeditiously according to Josephs interpretation of the revelation and/or additional revelation that he received! They were currently working on the second floor of the building at that time of the announcement and while it may be true that they could have been working harder and faster than they did, I am not convinced that they could have had it completely finished in that amount of time without supernatural help. I think the reason that the Saints had become alienated from God and prevented from doing baptisms for the dead, is because of something else. “ 47 AND IT SHALL COME TO PASS that if you build a house unto my name, and do not do the things that I say, I will not perform the oath which I make unto you, neither fulfil the promises which ye expect at my hands, saith the Lord. I think the above prophecy tells the real story. Hence, Lyman was right in his observation that God was angry with the Saints and that their actions had been cursed, however I believe it was related to the practice of abominations, not the failure to complete the temple in the appointed time. I believe God, in his great mercy continued laboring with the Saints for a while after that point in time and would have allowed them to complete the temple and usher in the dispensation of the fullness of times and the marvelous work and a wonder had they repented of their abominations and finished the temple by the sufficient period of time which had been allotted. Which I believe was on or about September 22 1844 or possibly September 11 1844 (September 11th had been the appointed time in Kirtland to redeem Zion). If indeed the appointed time for the Marvelous Work to begin had been September 11th or 22nd 1844, that would have given the Saints over three years to complete the temple and the Nauvoo house which would have been sufficient time based on how much they accomplished during the first six months, had they been united striving in the effort with all of their might and all of their resources. I am not trying to minimize the serious consequences of not finishing the temple. Clearly, it was not ever finished in that generation despite what LDS apologists and historical revisionists say. And regardless of what the actual “sufficient time” frame was, the church obviously failed to finish and dedicate the temple by the required date which resulted in the rejection of the church with their dead. My point is simply that I believe the sufficient time period was not six months ending in October of 1841, it was obviously at least a few years later. And I am speculating that it possibly came to an end on September 22nd 1844. I believe the reason the Lord rejected baptisms for the dead in the river had to do with the abominations being practiced in Nauvoo. I would elaborate on what I think those abominations were, but I have beat that poor horse sufficiently in previous posts. Again, the main point I want to make is simply that it appears that there may have been three consecutive prophetic seven year sequences during the LDS foundation movement, the last of the three may very probably ended on September 22nd 1844. You might be wondering why these past time sequences are of worth to us. And you are probably really wondering what any of this has to do with the current crises in the gulf. I’ll address this later in this post… be patient. So, why is the feast of trumpets and these three consecutive seven years cycles of prophecy that uses the feast of trumpets trigger dates important to us who are living four generations later? Because God repeatedly warned the Saints that his judgments would fall on the wicked of the 3rd and 4th generation and these seven year cycles may possibly provide us with a typological template by which to identify when the final feast of trumpets takes place, heralding the start of the Marvelous Work and a Wonder! I have blogged several times about the 400 year prophesy in Genesis and how I believe the literal fulfillment had to do with the Israelite pilgrims from England that landed on the shores of America and 1607, planted the cross in this land and dedicated it to Jesus Christ. Indeed latter day Israel has been wondering in this strange new promised land for 400 years up until 2007. Is it possible that the year 2007 is the trigger date for beginning a seven year prophetic time sequence? Is it a coincidence that 2007 was a Sabbatical Year in the Jewish Calendar and that a second Sabbatical year began in September of 2008. After the completion of the seven year cycle beginning in 2007, the next Sabbatical Year is in 2014/15 according to some scholars. Many prophecy scholars agree that the bible speaks of a seven year period of prophecy in the end times which is divided into two 3 ½ year periods, yet no one seems to be able to identify exactly when this seven year cycle begins. There is no shortage of speculation on when the seven year prophetic cycle begins and ends. Pastor Mark Biltz is a fascinating prophecy scholar that relies heavily on the feasts of Israel in interpreting the latter day signs of the times as well as the times of the signs… he has pointed out that Daniel’s seventieth week will be a seven-year Sabbatical cycle. Students of biblical prophecy have long compared Daniel’s seventieth week with the Tribulation Period as laid out in the book of Revelation. Intrigued with the Scriptures that repeat over and over again that our Savior’s Second Coming will be heralded with signs in the heavens, in which the sun will be turned into darkness and the moon into blood, Pastor Mark Biltz went on the Internet, to a U.S. Government web site, to see if he could find any solar or lunar eclipses over the next few years that might be significant. To his surprise, he found four lunar eclipses and two solar eclipses in the Sabbatical Year of 2014 and 2015. Also, he noticed that they all appear on Jewish Holy Days! This is most unusual. It is a rare occurrence for four lunar cycles to happen on successive Passover and the Feast of Tabernacles (Sukkot) observances. It will not happen again for hundreds of years. Although it is possible that amazing things will happen on the above dates, my immediate concern has to do with identifying the beginning of the last seven year cycle. By doing so, I can identify the midpoint of that cycle which very possibly marks a major prophetic event as well as identifying the general time frame in which the Marvelous Work and a Wonder begins. I have speculated for some time that the seven year prophecy cycle began immediately after the 400 years of the Genesis prophecy came to its completion, but I have not been able to find any hard scriptural evidence to back that feeling up… until now. The prophetic time line I am about to present to you is based on an incredible prophecy in the controversial Book of Joseph. The financial crisis of 2007 to the present is a crisis triggered by a liquidity shortfall in the United States banking system caused by the overvaluation of assets. It has resulted in the collapse of large financial institutions, the bailout of banks by national governments and downturns in stock markets around the world. In many areas, the housing market has also suffered, resulting in numerous evictions, foreclosures and prolonged vacancies. It is considered by many economists to be the worst financial crisis since the Great Depression of the 1930s. It contributed to the failure of key businesses, declines in consumer wealth estimated in the trillions of U.S. dollars, substantial financial commitments incurred by governments, and a significant decline in economic activity. Many causes have been suggested, with varying weight assigned by experts. Both market-based and regulatory solutions have been implemented or are under consideration, while significant risks remain for the world economy over the 2010–2011 periods. As you can see, it is a commonly accepted fact that the global financial crisis began in 2007. Interestingly, the first year of the crisis culminated a week later in the week of September. 15-22, 2008 beginning with Lehman Brothers filing for bankruptcy and culminating on September 29, 2008 which was on the eve of Rosh Hashanah, also known as the Jewish New Year or The Feast of Trumpets. Although it is common knowledge that the global meltdown began in 2007, what many people don’t understand is that the melt down does not simply represent the loss of wealth, it represents the transfer of wealth! You may be shocked to find out that during the last three years the wealthy elite have been robbing the nation of America and all of the nations of the world. They have been transferring wealth from the masses to themselves by manipulating currencies and the stock market and by using sophisticated investment vehicles. The largest crime in the history of the world has been taking place during the last three years from 2007 to 2010. Some of the wealthy elite have doubled their fortunes annually since the global financial crises began. If you know what is going to happen before it happens, it is not hard to make the right investments and maneuvers and to accumulate an obscene amount of wealth. Here is a portion of a commentary on the internet regarding this amazing event that we are currently witnessing by an astute person that recognizes this event in biblical prophecy. The author notes that …”our coffers have been raided and our treasury has been plundered” and he associates it with the alarming prophecy in Isaiah 10 wherein Isaiah foresaw that America would have their treasures robbed like someone taking the eggs from a nest without moving the wing of the sleeping bird. …this, in itself, is great cause for Revolution against the current World system–but we just sit on our intellectually lazy ars and abide by the old cliche’;–“Oh well, the Rich get Richer”–this statistic of 2009’s results makes my case here highly plausible within itself; in the midst of a terrible economic crisis the majority became less wealthy while the most wealthy increased their wealth by 50%–might they be the true “ruling portion of the community“?? And you think that these things have not been foreseen!? !–“For he says, “By the strength of my hand I have done it, and by my wisdom; for I am prudent: and I have removed the bounds (=boundaries=Globalism) of the people, and have robbed their treasures, and I have put down the inhabitants like a valiant man; and my hand has found as a nest the riches of the people; and as one gathers eggs that are left, have I gathered all the earth; and there was none that moved the wing, or opened the mouth, or peeped?” (Isaiah 10:13,14)… btw According to the Associated Press, experts believe that 2009 saw the largest single year increase in the U.S. poverty rate since the U.S. government began calculating poverty figures back in 1959 and yet, The 50 wealthiest members of Congress saw their collective fortunes increase from 85.1 million dollars to $1.4 billion in 2009. Isaiah notes that in the last days, Gods people are robbed and spoiled because they were not obedient to the law! Ok, having reviewed that the 400 year prophesy came to an end in 2007 and that 2007 was the beginning of the global financial meltdown as well as the global plundering of the nations by the wealthy elite, we are now ready to review the amazing prophecy in the Book of Joseph. Remember, the huge increase in wealth by the wealthy began in 2007. 2:10 For thou hast dealt deceitfully with Jacob. And hast made him serve thee unjustly seven years. And know thou this: that the Lord shall rescue the oppressed and judge the unjust in due season, to reward the righteous and to destroy the wicked. 2:11 Yea, the righteous shall inherit the wealth of the wicked and the fatness of all the earth: for the earth is the Lord’s and the fulness thereof. 2:12 The wicked shall prosper for a season, howbeit the Lord keepeth his eye on the righteous and on the wicked, and shall judge them in the time which he hath appointed for his own purpose. 2:13 And in the latter time, the wicked shall be exceedingly prosperous seven years. And then the Lord shall come suddenly and pronounce swift judgment upon them and destroy them all. Yea, the God of heaven and earth shall smite them with the fury of his wrath which shall be poured out upon their heads without mixture. Then shall the wealth of those who do wickedly be given unto the the sons of righteousness who shall shine like the stars. And the sons of righteousness shall inherit the earth forever, yea, even shall they shine upon it forever and ever. And the earth shall not pass into the hand of another. I find the above prophecy in the Book of Joseph to be astounding. It would appear, if this book is a credible and authentic translation of the words of Joseph of Egypt, and if the seven years of increased wealth of the wealthy is indeed referring to the beginning in 2007, that at the end of the seven year period, the Lords wrath will descend on the wicked! That would seem to correspond with the Passover, April 4, 2015 and The Feast of Tabernacles, September 28, 2015 as pointed out by Paster Biltz. When does the Marvelous Work Begin? Again, I am not as interested in the latter part of the seven year prophecy and the wrath of God that descends on the wicked at the completion of the seven years as I am with identifying the beginning, and midpoint of the seven years because that is where we appear to be right now! 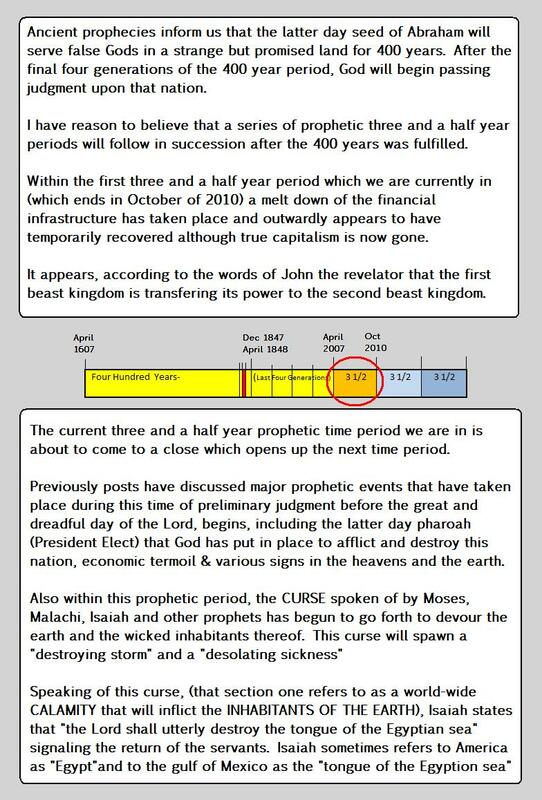 If in fact the seven year time period began in 2007 at the close of the 400 year prophecy, they likely began in April or September of 2007 since those are the major prophetic trigger points of the year in which the ancient feasts of Israel and the LDS general conferences are held to this very day. If in fact the seven year prophetic time period began in 2007… then the midpoint of the two 3 ½ year periods is upon us very soon! If the time period began in April, then this October marks the midpoint. If it began in October of 2007, then the midpoint begins in April of 2011. Either way, the midpoint is very close, within 2 to 8 months. I believe that the midpoint very possibly marks the beginning of one or both of the 3 ½ year prophetic events mentioned by John the Revelator in the Book of Revelation. If that is the case, then God needs to REMEMBER HIS COVENANT and send his servants to raise the warning voice and declare the gospel with the sound of a trump BEFORE the midpoint in October of 2010 or April of 2011! That would mean that the marvelous Work and a Wonder and the dispensation of the fullness of times would be ushered in VERY SOON! By the way, the seven year prophecy in the book of Joseph seems to be typological of the seven years of famine that Joseph of Egypt was instrumental in gathering wheat into the storehouses, for it mentions that event in the Book as well. “The dream hath troubled me that sleep is fled far away from me; and I lay troubled on my bed. Therefore I pray thee, Joseph, shew me the meaning thereof, that I may have peace. 7:11 And Joseph fell on his face before Pharoah and cried, after the seven years of bounteous harvest are passed, there shall be seven years of famine; yea, even a sore famine which hath not ever been in Egypt nor in all the earth. 7:13 And if thou heedest not, thy people shall become a great abborance unto the whole earth. There shall be death of man and beast such as there has never been on the face of the whole earth. 13. And by this means shall the just be saved from famine, while the nations of the wicked are distressed and faint. 14. In due time shall he go forth toward the north, and by the power of his word shall the deep begin to give way; and the ice melt before the Sun. BTW…. Want to guess what date Oliver gave that patriarchal blessing to Joseph? You guessed it.. it was on September 22nd. Oliver gave Joseph Smith that patriarchal blessing on September 22, 1835 on one of the key dates of the second seven year cycle of the foundation movement! It was interesting timing because the 3 ½ years during which the fullness of the gospel was ultimately rejected had just expired in late 1834 and so the Lord was providing comfort by foretelling that Joseph would be returning during the 3rd watch to make preparations for the elect during the time of tribulation and famine. So… if the past provides keys to the future and if the prophecy in the book of Joseph is authentic, this September could be a very significant prophetic time period… and if not this September, then possibly the next one.. or the next… LOL! I am not claiming to be a prophet. I have not been visited by an angel. I have not had a vision or a dream. I have not had the heavens open and the voice of God speak to me. I am simply observing a few current historical facts in the context of an obscure prophecy from an apocryphal ancient document that very few people believe is authentic. In short, my observation is total speculation by someone who is simply watching for the preparatory events that precede the Saviors return as a thief in the night, followed by his return in glory…. Those preparatory events have to do with Father Adam and the first laborers of the last kingdom returning to the vineyard to prepare us for the coming of the Lord. I suspect that you are still wondering what in the world the feast of trumpets and any of this time line stuff has to do with the crisis in the gulf and the curse that ancient prophets have spoken about. Then we know, according to modern revelation that there is going to be a great whirlwind at the time of the servants return. It is only fitting that the latter day Elijah would return to the earth with a whirlwind just as the ancient Elijah was carried away into the heavens in a whirlwind. We also know according to Isaiah that his return is accompanied by a destroying storm. Jeremiah calls it a destroying wind…. 6 Flee out of the midst of Babylon, and deliver every man his soul: be not cut off in her iniquity; for this is the time of the Lord’s vengeance; he will render unto her a recompence. This destroying storm that Gods servant brings with him appears to bring a desolating sickness that will empty the land along with the other natural disasters and war that take place. With this in mind, brother Simmons and others have warned that a hurricane could carry the toxic substances contained in the gulf across many parts of America which would cause a desolating sickness to cover the land! THAT’S WHAT THE FEAST OF TRUMPETS AND THE SEVEN YEAR PROPHETIC TIME SEQUENCE HAS TO DO WITH THE CURRENT GULF CRISES WHICH IS THE BEGINNING OF THE CURSE THAT ISAIAH AND OTHER ANCIENT PROPHETS HAVE PROPHESIED OF. Is the trump is going to sound this September? Is the destroying storm coming off of the gulf going to materialize this September? Is the One Mighty and Strong and his fellow laborers going to return this September to raise the warning voice, declare the gospel as with (and at the time of) the sound of a trump? Am I going to be watching for it? Cuz that’s what I do. PS for those interested, I have posted the entire Book of Joseph below with highlighting in places I thought were extremely significant. Also contained is some background info on this document of questionable origin. “The public mind has been excited of late, by reports which have been circulated concerning certain Egyptian mummies and ancient records, which were purchased by certain gentlemen of Kirtland, last July. It has been said that the purchasers of these antiquities pretend they have the bodies of Abraham, Abimelech (the king of the Philistines), Joseph, who was sold into Egypt, & c., & c., for the purpose of attracting the attention of the multitude, and gulling the unwary; which is utterly false. Who these ancient inhabitants of Egypt were, I do not at present say. Abraham was buried on his own possession “in the cave of Machpelah, in the field of Ephron, the son of Zohah, the Hittite, which is before Mamre,” (Genesis 49:29-31) which he purchased of the sons of Heth. Abimelech lived in the same country, and for aught we know, died there; and the children of Israel carried Joseph’s bones from Egypt (Genesis 50:25),when they went out under Moses; consequently, these could not have been found in Egypt, in the nineteenth century. The record of Abraham and Joseph, found with the mummies, is beautifully written on papyrus, with black, and a small part red, ink or paint, in perfect preservation. The characters are such as you find upon the coffins of mummies—hieroglyphics, etc. ; with many characters of letters like the present (though probably not quite so square) form of the Hebrew without points. The records were obtained from one of the catacombs in Egypt, near the place where once stood the renowned city of Thebes, by the celebrated French traveler, Antonio Sebolo, in the year 1831. He procured license from Mehemet Mi, then Viceroy of Egypt, under the protection of Chevalier Drovetti, the French Consul, in the year 1828, and employed four hundred and thirty-three men, four months and two days (if I understand correctly)—Egyptian or Turkish soldiers, at from four to six cents per diem, each man. He entered the catacomb June 7, 1831, and obtained eleven mummies. There were several hundred mummies in the same catacomb; about one hundred embalmed after the first order, and placed in niches, and two or three hundred after the second and third orders, and laid upon the floor or bottom of the grand cavity. The two last orders of embalmed were so decayed, that they could not be removed, and only eleven of the first, found in the niches. On his way from Alexandria to Paris, he put in at Trieste, and, after ten days’ illness, expired. This was in the year 1832. Previous to his decease, he made a will of the whole, to Mr. Michael H. Chandler, (then in Philadelphia, Pa.,) his nephew, whom he supposed to be in Ireland. Accordingly, the whole were sent to Dublin, and Mr. Chandler’s friends ordered them to New York, where they were received at the Custom House, in the winter or spring of 1833. In April, of the same year, Mr. Chandler paid the duties and took possession of his mummies. Up to this time, they had not been taken out of the coffins, nor the coffins opened. On opening the coffins, he discovered that in connection with two of the bodies, was something rolled up with the same kind of linen, saturated with the same bitumen, which, when examined, proved to be two rolls of papyrus, previously mentioned. Two or three other small pieces of papyrus, with astronomical calculations, epitaphs, &c., were found with others of the mummies. When Mr. Chandler discovered that there was something with the mummies, he supposed or hoped it might be some diamonds or valuable metal, and was no little chagrined when he saw his disappointment. I was then unknown to Mr. Chandler, neither did he know that such a book or work as the record of the Nephites, had been brought before the public. From New York, he took his collection on to Philadelphia, where he obtained the certificate of the learned, and from thence came on to Kirtland, as before related, in July. “The language in which this record is written is very comprehensive, and many of the hieroglyphics exceedingly striking. The evidence is apparent upon the face, that they were written by persons acquainted with the history of the creation, the fall of man, and more or less of the correct ideas of notions of the Deity. The representation of the god-head—three, yet in one, is curiously drawn to give simply, though impressively, the writers views of that exalted personage. The serpent, represented as walking, or formed in a manner to be able to walk, standing in front of, and near a female figure, is to me, one of the greatest representations I have ever seen upon paper, or a writing substance; and must go so far towards convincing the rational mind of the correctness and divine authority of the holy scriptures, and especially that part which has ever been assailed by the infidel community, as being a fiction, as to carry away, with one mighty sweep, the whole atheistical fabric, without leaving a vestage sufficient for a foundation stone. Enoch’s Pillar, as mentioned by Josephus, is upon the same roll.—True, our present version of the bible does not mention this fact, though it speaks of the righteousness of Abel and the holiness of Enoch,—one slain because his offering was ac-cepted of the Lord, and the other taken to the regions of everlasting day without being confined to the narrow limits of the tomb, or tasting death; but Josephus says that the descendants of Seth were virtuous, and possessed a great knowledge of the heavenly bodies, and, that, in consequence of the prophecy of Adam, that the world should be destroyed once by water and again by fire, Enoch wrote a history or an account of the same, and put into two pillars one of brick and the other of stone; and that the same were in being at his (Josephus’) day. The inner end of the same roll, (Joseph’s record,) presents a representation of the judgment: At one view you behold the Savior seated upon his throne, crowned, and holding the sceptres of righteousness and power, before whom also, are assembled the twelve tribes of Israel, the nations, languages and tongues of the earth, the kingdoms of the world over which satan is represented as reigning. Michael the archangel, holding the key of the bottomless pit, and at the same time the devil as being chained and shut up in the bottomless pit. But upon this last scene, I am able only to give you a shadow, to the real picture. I am certain it cannot be viewed without filling the mind with awe, unless the mind is far estranged from God: and I sincerely hope, that mine may never go so far estray, nor wander from those rational principles of the doctrine of our Savior, so much, as to become darkened in the least, and thereby fail to have that, to us, the greatest of all days, and the most sublime of all transactions, so impressively fixed upon the heart, that I become not like the beast, not knowing whither I am going, nor what shall be my final end! I might continue my communication to a great length upon the different figures and characters represented upon the two rolls, but I have no doubt my subject has already become sufficiently prolix for your patience: I will therefore soon cease for the present.—When the translation of these valuable documents will be completed, I am unable to say; neither can I give you a probable idea how large volumes they will make; but judging from their size, and the comprehensiveness of the language, one might reasonably expect to see a sufficient to develop much upon the mighty acts of the ancient men of God, and of his dealing with the children of men when they saw him face to face. Be there little or much, it must be an in-estimable acquisition to our present scriptures, fulfilling, in a small degree, the word of the prophet: For the earth shall be full of the knowledge of the Lord as the waters cover the sea. However in light of what Oliver Cowdery related above, it is clear that there was at least some preliminary attempt at a partial translation, but nothing that was ever published. I present this alledged translation here only as a reference for anyone interested in such historical documents. I have added related Bible references in parenthses at the end of each verse. An account of Joseph, the son of Jacob, the son of Issac, the son of Abraham; which account was written by the hand of Moses by the word of the Lord while he dwelt in the house of Jethro the Midianite. 1:1 And it came to pass, Rachel, the wife of Jacob, was drawing water from a well and suddenly two angels of the Lord with shining garments stood before her saying, Fear not handmaiden of the Lord, for thou art a chosen vessel to bear a choice branch unto the Lord. And Rachel said, I know not what ye say, my lord. 1:2 And one of the angels said unto her, Jacob shall be a tree of life reaching unto all the earth. Over the high walls shall his branches reach. Even unto the isles of the sea which are afar off. And his seed shall rule all lands and trample down all people, for the Lord God Almighty shall make strong his seed. 1:3 Rachel, thy reproach is taken away from thee and thou shalt bare a son, and thou shalt call his name Joseph, for the Lord thy God shall make him two great nations, yea, even mighty nations before him. 1:4 And immediately Rachel ran down unto Jacob and sayeth unto him, the Lord hath taken away my reproach, and openeth my womb, and I shall bare thee a son which shall be two great and mighty nations before the Lord. 1:5 And when Jacob heard this he rejoiced and did offer a burnt offering unto the Lord saying: O Lord God, yea, even the Most High God of heaven and earth, surely through my seed shalt thou show thyself faithful of the promises made unto my fathers. 1:6 And as the sweetsmelling aroma did ascend unto heaven which did fill the nostrils of the Lord. And the Lord did hear Jacob. 1:13 And so Jacob took possession of all the livestock which Laban had given unto him. 2:6 And in this manner did Laban severely accuse Jacob that he might persuade him to give unto him a portion of Jacob’s increase. 2:7 And lo, the angel of the Lord appeared unto them as they were speaking. 2:8 And Laban fell to the ground and hid his face for he was sore afraid at the sight. 2:9 And the Angel of the Lord said unto Laban, I have commanded Jacob to do this thing that thou mayest know that The Lord respecteth Jacob and not Laban. And in the latter time, the wicked shall be exceedingly prosperous seven years. And then the Lord shall come suddenly and pronounce swift judgment upon them and destroy them all. 2:14 When Laban heard this he did heap dust upon his head and said, forgive me this wrong, my Lord. If there is anything which Jacob desireth, the same may he freely take. I pray thee, lord, spare my life and my house. 2:15 And the Angel of the Lord appeared unto Jacob and said, take thy wives and all thy possessions and return to thine own land. And take the gods of Laban that he may know that the Lord is the Most High God over all the earth. And so did Jacob as the Lord had commanded. 2:16 And when Laban had perceived that his idols were removed, he was hot with fury. And said to his kindred and slaves, who hath removed the gods from before the altar? 2:17 And none in Laban’s house knew whither they had been taken. 2:18 And Laban went to the place where Jacob had dwelt, and finding him not, Laban uttered cursings against him in the names of his gods. 2:19 And Laban and his kin and all of his slaves did pursue Jacob. And when they had found Jacob and his kin, Laban seized Jacob by the throat and said, I have offered thee that thou mayest take any of my possessions. Yea, even of my gold and silver, and mine own daughters mayest thou freely take. 2:20 Why didst thou dishonor me by taking my gods and thereby bring a curse upon my head and upon my house? 2:21 And behold the word of the Lord came unto Jacob and Laban in the midst of their disputation and said, the Lord hast commanded Jacob to take thine idols that the house of Laban might know that the Lord is the Most High God over all the earth, yea, even the Most High over the house of Laban. 2:22 Yea, the Lord is God even over all nations and kindreds of the earth. For the earth is mine, and the fulness thereof, sayeth the Lord. And there is no other. And I, the Lord, exalteth as many as I will, and debaseth as many as I will: for men are as grasshoppers unto me. And none can stay my hand. Who has an arm like unto the Lord’s? Who hath frustrated Him when he hath decreed his decree? 2:23 And Laban began to tremble exceedingly before the Lord. And his countenance became exceedingly fearful. 2:24 And the Lord said, Behold thy gods! And the idols of Laban did melt before the eyes of Jacob and Laban as they stood by. 2:25 And a chariot of the Lord did he cause to pass by. And the noise thereof was like the sound of mighty rushing waters. Awesome and terrible was the sound of it. And the chariot had the appearance of lightning and fire was in his mouth. Awesome and terrible was the sight to behold in the eyes of Jacob and Laban. 2:26 And the Lord did cause a violent whirlwind to appear which did scatter the ashes of the idols of Laban whereby they could be found no more at all. And Jacob and Laban fell to their faces and cried out: how marvelous and terrible is the hand of the Lord God! 2:27 Gods which are fashioned by the hand of a man when he sayeth in his heart: I shall fashion a god and bring my hand upon it; and use my tools upon it. And I shall bow down before it. 2:28 Behold, they are gods which can neither see, nor can they hear; neither can they speak. They are gods that are no gods, for the Lord Most High is the one true living God who dwelleth in the heavens and who reigns over all the earth. 2:29 And He did make the sun, and the moon, and the stars, and yea, even all of the sons of men. And they are merely dust in his hand and breath from his mouth. 2:30 And Jacob and Laban were astonished at all the things which the Lord had said and done before them. And Laban made a vow that he and his house should serve the true and living God for ever. 2:31 And after the angel of the Lord had departed, Jacob offered a choice lamb unto the Lord for a sacrifice for the sake of Laban and his house. And Laban returned unto his house. 3:2 And the Angel of the Lord appeared unto Jacob in a dream saying, Joseph shall be two great and mighty nations in the hand of the Lord. 3:3 These nations shall be greater than any nations upon the face of the earth. Howbeit, only a remnant shall see my face and live. 3:4 Behold, wisdom shall increase in the latter time. And men shall make weapons of war; yea, even terrible weapons which shall touch the power of the Most High. 3:5 And the seed of Joseph shall believe a lie, wherein the terrible weapons shall be for the protection of their lands. And wo unto them, for the people shall be deceived. 3:6 And the Lord showed Jacob a vision, and said: behold, the mighty men of the earth shall lay an awful scheme by the word of their god, that they should destroy the Lord when he shall visit men at the appointed time when he shall reward the sons of men according to their works. 3:8 Who have said among themselves: the Lord is no god wherein we should fear him, for by our mighty power have we become gods ourselves and have spread abroad ourselves over all the earth. Yet shall they be judged and cut off from among the sons of Jacob. 3:9 Thus sayeth the Lord: The wicked plot in vain. And they shall drink from the cup of vanity which they have grasped: for the Lord himself shall utterly destroy them all by the brightness of his terrible presence. 3:11 Yea, Azaziel shall be bound; even he who hath granted them their great authority and their seat and who hath whispered lies into their ears like a cunning serpent which lieth in the dust. The Lord himself shall come and bind him with cords which cannot be loosed, and seal him up with a seal which cannot be broken. 3:12 For Azaziel hath led them astray by his corrupted wisdom which hath become folly in the sight of heaven. Wo unto him for he hath laid waste the cities of the garden of God and made the inhabitants of the earth stumble exceedingly, causing them to be drunk from the cup of blindness, yea, even to feast from the table of rebellion. 3:13 Comfort thyself with these words, thou beloved Jacob. For verily, the Lord reigns supreme over all the gods and shall swiftly mete out justice which cannot be overthrown. Amen. 3:14 And Jacob was astonished at all the Lord had shown him: for weak was his understanding, and without strength was his soul in the presence of the Lord. 4:1 And it came to pass, Joseph, the son of Jacob, grew in stature unto a man. And Joseph was a peculiar child, full of knowledge and wisdom. 4:2 And is came to pass the angel of the Lord appeared to Jacob and said, make a tunic for thy son Joseph, and place on it the holy emblems of the priesthood of the Lord thy God. 4:4 For I shall cause Joseph to go down into the land of the sun, a land full of idolatry and iniquity, and I shall cause him to be a savior among the people for the sake of thy seed. 4:5 And he shall bare the priesthood of the Most High, and become a mighty ruler among the Egyptians. And the Lord shall bless whomsoever he shall bless, and curse whomsoever he shall curse: for my name shall be in him. And great shall be his name in the land. Wherefore Pharaoh shall know that he is a prince with God. 4:6 And behold, he shall seal up the blessings of the priesthood for the generations which are afar off, that the Most High may have witness for Himself in the latter time, before the great and final day when the Lord himself shall come and reward the sons of men according to their works, whether they be good or whether they be evil. Even so. Amen. 4:8 And Jacob instructed him in the hidden wisdom of the Lord, whereunto Joseph should be a priest of the Most High God. 4:10 And they gathered unto their father Jacob saying, why hast thou given that Joseph should receive a tunic and become a priest unto the Lord and not us also? 4:11 And Jacob rebuked them saying, Joseph is a chosen vessel whom the Lord hath chosen, and it is according to his purposes. Who are ye that ye dare accuse God? 4:12 Verily, the Lord hath chosen him for his own purposes and ye shall well abide under it. For this is the word of the Lord. 4:13 And when Jacob had finished speaking, his sons murmured among themselves. 4:17 And his brothers mocked him saying, as the Lord liveth and as we live, thy blood shall be spilt on the ground before we fear thee. 4:19 And when Jacob heard of this he said unto Joseph: do not fear my son: as the Lord hath decreed his decree, thou shalt be a prince over me and all mine house. 4:20 Yet pride hath filled thine heart. Let no boasting be found at all in thy mouth, yea, neither in thine heart, lest thou fall under condemnation: for the Lord God doth hate a proud and boastful heart. 4:21 Thou didst come into this world naked and thou shalt leave it naked. 4:22 And remember this, my son, the Lord exalteth whom he will, and the Lord abaseth whom he will. Therefore thou shalt keep thine heart humble before him all the days of thy life. 4:23 And Joseph was pierced in his heart, and durst not open his mouth again for to boast. 5:1 And it came to pass, Joseph was in the desert seeking his brethren and they seized upon him, and mocked him, saying: behold, our prince is come unto us. Mayest thou live long, and may thy kingdom be forever! 5:2 And they worshipped him in mocking fashion, saying, have mercy on us O king! Save us, O mighty one! 5:3 And they seized upon Joseph to kill him. And Dan drew his sword and thrust it into the side of Joseph, howbeit it pierced not his flesh. 5:4 And all who stood by were astonished. And Reuben said, Verily, the Lord hath surely chosen him, and the power of the Most High dwelleth with him. 5:5 Suffer not our hands to shed his blood, for his blood should surely cry up to the Lord against us, and great would be the curse against our children unto seven generations. 5:7 Now, after Joseph’s brothers had departed from the pit into which they had cast Joseph, a band of Midianites came nigh unto it. 5:8 And Hanok, the chief of the Midianites, said unto Joseph, I perceive that a great evil hath befallen thee. What shalt thou give unto me that I remove thee from this pit. 5:9 And Joseph said unto them, I shall serve thee all the days of my life if thou removest me from this pit. Therefore, I pray thee, go unto my Father’s house and tell my father whereunto thou shalt take me, for it is the will of the Most High God that I should go with thee. 5:11 And Hanok sent one of his servants to Jacob that Jacob might know of the thing which had befallen Joseph. And after the servant had spoken the thing which had befallen Joseph, Jacob said unto him: this thing is by the hand of God. 5:12 And Jacob wept bitterly. And Jacob bade the servant of Hanok to stay with him. 5:13 And while Joseph’s brothers were eating the evening meat, Reuben said, let us not suffer our brother to die. For the Lord shall surely avenge his death upon our heads and our children. 5:14 Therefore let us sell him to that yonder band of the sons of Ishmael that his blood be not upon us. And so they were agreed as one and bound themselves by an oath. 5:16 Then Reuben rent his tunic and said, what hath befallen our brother Joseph? May the Lord forgive us this evil which we have done unto our own brother whom the Lord hath chosen! And Reuben was bitterly sorrowful. 5:19 Howbeit Jacob knew that Joseph had not suffered the evil. And he kept the matter in his heart. 5:21 Deliver unto Joseph this tunic and all shall be well with thee and thine house: for the Most High God hath ordained it so. And the servant of Hanok said, I shall surely do it. 5:22 And Joseph(Jacob?) said, thou must swear an oath that thou keepest the matter in thine heart. And thou must not suffer thine eyes to gaze upon the tunic lest thou be cursed: for it is holy unto the Most High God. 5:23 And so they took a ram and made an covenant to keep the matter secret. And Jacob said unto the servant of Hanok: so shall it be unto thee if thou shalt break this covenant. 5:24 And so the servant of Hanok departed and delivered the tunic unto Joseph. 6:4 And Joseph taught wisdom unto Potifar, yea, even in all the ways of the Lord. And Potifar did forsake the gods of Egypt to serve the living God, even the God of Abraham, Isaac, and Jacob. 6:5 And Joseph taught Potifar the hidden wisdom of the Lord, even of the holy priesthood of God. And Potifar became a priest unto the Most High God at the hand of Joseph. 6:8 Howbeit Shinmin relented not. And so Shinmin said unto Joseph, if thou liest not with me, I shall cause thee to be cast into the prison until thou repent. 6:9 And Joseph said, by my head and by the Lord of Hosts, I shall never lie with thee. 6:14 So Potifar commanded his slaves to seek after Joseph and deliver him up. 6:15 And when Joseph was delivered unto Potifar, he said, I have given thee to be the master over my whole house. Yea, there is save I alone over thee. Why hast thou dealt with me in this manner, to bring shame upon my house? 6:16 And Joseph said, I have done no evil unto thee, my lord. The wife of thy youth did seize my tunic and did plead with me to lie with her. And for righteousness sake and because of mine oath, I lied not with her. 6:17 And Potifar said unto Joseph: of a surety, I know that the thing which thou speakest is true. 6:18 And Potifar said, Of a truth, thou hast not sinned. Yet for the sake of reproach, I must deliver thee to prison for a little season, for thou art an Hebrew slave in Egypt, and Pharoah shall be sore displeased if he heareth of the matter, and lest he take away my name and my house I must do this thing. 6:20 Inasmuch as thou entreat him like a brother, the living God shall bless thee and thine house. 6:22 And Joseph became known unto the house of Pharoah. 7:1 And it came to pass, Pharoah sent for Jacob(Joseph? ): for he had become renown in Egypt as one having the spirit of the gods, and an interpreter of dreams. 7:3 Howbeit I perceive that thou, Joseph, art filled with the wisdom of the lofty ones. 7:4 I pray thee, tell me the meaning of my dream and thou shalt be greatly rewarded, for verily, all of Egypt lieth in mine hand. 7:5 And Joseph said, mayest thou live forever, O king. Verily, I am dust and ashes, and there is no wisdom in me. Howbeit the Spirit of the Lord Most High who is with me can tell the meaning thereof. 7:8 The dream hath troubled me that sleep is fled far away from me; and I lay troubled on my bed. Therefore I pray thee, Joseph, shew me the meaning thereof, that I may have peace. 7:15 And there was not anyone in the land of Egypt who was greater than Joseph save Pharoah. Thus did the Lord bless Joseph. 8:1 And it came to pass, the angel of the Lord appeared unto Joseph in a dream saying, Joseph, thou art a chosen vessel from among the children of men and a great blessing unto all the earth. 8:2 Thou shalt become two great and mighty nations in the hand of the Lord: for the Lord exalteth whom he will, and the Lord abaseth whom he will. And who can stay his mighty hand? 8:3 And the Lord performeth this that he may richly reward his faithful among the sons of men with the riches of the earth. For the Lord delighteth in the righteousness of his children, that he may prosper them with all blessing. 8:4 Therefore walk humbly before thy God; for this day I have ordained thee to be a savior in the land of Egypt, wherein the Egyptians shall bare thee on their shoulders and call thee blessed; Moreover, thou shalt preserve thine house and the holy wisdom of the Lord from destruction. 8:5 And when many days have passed, thy seed shall be cause for a great work of the Lord in the sight of the heathen unto the glory of the Lord. 8:6 And when Joseph did awaken from his sleep, he was astonished at all the Lord had said unto him. 9:2 And the Lord placed his seal upon them. 9:4 And the angel of the Lord appeared to Joseph in a dream saying, thy sons Manasseh and Ephraim shall be two mighty nations before the Lord. 9:5 And they shall be as two stiffnecked and rebellious goats which runneth away when they heareth the voice of the shepherd. In the latter time they shall be a scourge and a terror and shall fight the Lord when he comes to reward the sons of men. 9:6 Howbeit, a remnant shall be faithful unto the Lord. And the He shall give them the earth as an inheritance with thee after I have raised up thy bones from the dust. 9:7 And the Lord spake again unto Joseph saying, Behold, the famine which shall overtake the land is at hand. When the famine hath become a sore burden on thy kindred, thy brothers shall appear unto thee. Be thou merciful unto them, as I am merciful unto thee, and all shall be well with thee and thy masters house. 10:2 And the sons of Jacob said among themselves, we have little to eat; wherefore shall we suffer ourselves to perish with hunger in this place which hath been forsaken by the Lord? 10:3 And thus they did murmur against the Lord their God. 10:4 Howbeit Jacob knew of the honor which the Lord had given unto his son Joseph at the hand of Pharoah. 10:5 And it came to pass, Jacob said unto his sons, make haste and go down unto Egypt for the Lord hath made known unto me that there is a ruler among the Egyptians who is full of wisdom and knowledge of the Lord. 10:8 And when the brothers of Joseph were come to Egypt, they sought to buy grain. 10:9 And a man by the way said unto them, go and seek ye Joseph the prince, for he selleth grain. 10:12 Howbeit the brothers of Joseph knew him not for his appearance and language was according to the Egyptians. 10:16 And they answered, not so, lord; we have need of grain that we perish not, for this great famine hath reached unto our land, and hath become a scourge unto us. 10:17 And Joseph was bitter in his heart, yet he remembered the commandment of the Lord. 10:19 And the brothers counciled among themselves that they might bring the younger brother unto Joseph. And Joseph heard it, howbeit the brothers knew it not, for Joseph had spoken unto them by his interpreter. 10:20 And when Joseph beheld them counciling among themselves, he had compassion on them. 11:2 And when Joseph turned he beheld the angel of the Lord standing in a flame of fire. And Joseph cried out saying, I am a dead man. For mine eyes have seen the glory of the king of heaven! 11:3 And immeadiately the strength of Joseph left him and he fell to the ground as a dead man. 11:4 And the angel of the Lord touched Joseph saying, Joseph, Joseph, stand up on thy feet as a man and fear not. 11:6 And through thy seed all the nations shall be blessed with the fruit of bounty: where the wine shall overflow the vats; and where the milk shall overflow unto the dung hills. 11:7 And after Joseph had arisen to his feet the Lord said: Behold the handiwork of the Lord! 11:9 And the angel of the Lord said unto Joseph: This is the kingdom which I have created for mine own purpose and it is very great. Is it not marvelous to behold? 11:10 And the vision multiplied before Joseph eyes. And Joseph said: what is the meaning of this, my Lord? It is great to behold and marvelous in mine eyes. 11:11 And the Lord said, these are lands upon which my seed abide. The land on which thou standest is one land among all of the lands which I have created by mine own my hand. And I set them on nothing, for I the Lord am the foundation of them. 11:12 Behold, the lands which number more than the sands of the sea. And this is my work and my great glory: to give unto my children that which I have prepared for them, yea, even all I possess. 11:13 And Joseph said, how great and mighty is the Lord, full of wisdom and strength and mercy: for I have never at any time considered that this could be. 11:14 And Joseph fell down and worshipped the Lord. 11:15 And the Lord said, Joseph if thou art faithful to the Lord all the days of thy life, and walk circumspectly before my face, thou shalt be lifted up, even to the throne of God, and thou shalt be a master workman in all wisdom, yea, even in all of the hidden wisdom which is the Lord’s. 11:16 And thou shalt inherit, with thy faithful seed with thee, the glory of the Lord. And thus shalt thou have great joy. For the Lord delights to give his children the works of his hands. 11:17 And thou shalt sit in my throne, yea, even the throne of God. And thou shalt be my son, and I shall be thy father, forever. Yea, even forever and ever. 11:18 And Joseph fell on his face and cried out, depart from me Lord, for I am not worthy to be called to such a great and marvelous honor. 11:21 For the Lord casteth the proud to the dust and exalteth the humble. The power of the wicked shall be completely destroyed, yet the Lord delights in the throne of the faithful. 11:20 And the Lord said: look up. And when Joseph had looked up, he beheld a great multitude which had the appearance of the sons of men. And they did shine like the sun. 11:21 And every one of them had a golden crown on his head. And they were singing and praising God around his glorious throne. And there was one in the midst of the throne which had a name written on him: and his name was ……., which intepreted means Wisdom of God. 11:22 And the Lord said unto Joseph: Joseph, my son, these are those who have glorified my name. They shall be my sons forever. And at the latter time thou shalt rise from the dust and take thy inheritance in the midst of mine holy congregation forever. Even forever and ever. Amen. 12:1 And it came to pass, Joseph was reasoning with the priests of On. 12:2 And the priests said unto him, surely hast thou communed with the gods, for there hath never been a wiser man in all of Egypt. 12:3 And Joseph taught the priests the knowledge of the Lord. And Joseph continued to gain favor in their eyes because of his exceedingly great wisdom which the Lord given unto him. 12:4 And some of priests secretly worshipped the God of Abraham, Issac, and Jacob, and said, if the Lord would have us be an ensample to the people, so be it, for we know that the Lord is God over all the earth. 12:5 And Joseph said, see that thou do it not. For the time is not fully come. Not many days hence shall you and your children openly serve the God of Abraham, Issac, and Jacob. Nevertheless, the time is not yet. 12:6 And Joseph taught unto those faithful to the Lord the hidden wisdom of the fathers saying: of a truth, this wisdom was given to Adam, and it has come down to us by the hands of my fathers. And many things did Joseph teach unto the faithful which cannot be written. 12:7 And, yea, it is not to be had among the wicked and unbelieving. For the Lord shall not suffer his holy wisdom to be defiled. 12:8 And Joseph taught them all things pertaining to the priesthood of the Most High. 12:9 And Joseph taught them knowledge concerning the sun, the moon, and the stars, saying, they are nothing save merely the works of hands of the Lord God. 12:10 And they were astonished that the sun was not a god, saying: if the sun being so marvelous is not a god, then surely how strong is the Lord Most High who hath formed it. 12:11 And Joseph said, not many years hence there shall arise a Pharoah which hath not respect for my people. They shall be treated with contempt and become slaves unto the people of Egypt. They shall become a stench and an abhorrance in the nostrils of the Most High. 12:12 And when the oppression becomes a burden too hard to bare, the Lord God will have mercy on them; and one shall arise at the word of the Lord who shall lead his people out of this place. 12:13 He shall be a prince in the king’s house notwithstanding he shall spring from the loins of my father. 12:14 When he opens his mouth he shall roar as a lion roareth. And when he standeth up, he shall speak with the voice of God almight. 12:15 And he shall shew forth the mighty wonders of God unto you. And he shall confound all of the wisdom of Egypt. And he shall lead you to a land which the Lord shall give unto you as an inheritance. 12:16 Him must you hear. 12:17 And there shall be great weeping and wailing in that day, for the Lord shall visit the iniquity of the fathers in Egypt upon the heads of the sons except they repent. robbed and spoiled; they are all of them snared in holes, and they are hid in prison houses: they are for a prey, and none delivereth; for a spoil, and none saith, Restore. I believe the seven year prophecy contained in the Book of Joseph matches up perfectly with many other historical event happening before our eyes, including the robbing of the treasures of this nation by the wealthy elite. What Mark Biltz also discovered, was that beginning seven years prior to 2015 the sun will become darkened three years in a row on the same day on the Biblical calendar: the first day of Av. A solar eclipse usually speaks of judgment on the nations, and exactly two months after the first of these solar eclipses, on the Feast of Trumpets, which is also called the Day of Judgment, God judged the world economy. The Dow Jones index on Wall Street fell 777.7 points, a 7% drop and a 700 billion dollar loss on a failed 700 billion dollar bail out package on the first day of the 7th month on God’s calendar, 7 years before the final blood red moon in 2015! Pastor Berggren points out that according to David Flynn in his bookTemple at the Center of Time, the words that were written on the wall are also measurements of money. You can see this as well in the notes of the NASB Bible. Mene is a mina, which normally equaled 50 shekels of silver.Tekel is another word for a shekel. And Parsin is half a mina. A shekel is 20 gerah. Together Mene, mene, tekel, parsin equals 2520 gerahs, which is the number of days in one prophetic week of years, or seven years! crisis, the text portion from the Torah for that day was about the flood of Noah. It is too late! The judgment has already begun. The Biblical Holidays are found in Leviticus 23 and spell out the Plan of YHVH (God). There are seven Festivals divided into two main seasons; 4 Spring Festivals and 3 Fall Festivals. The first four Festivals revealed the First Coming of the Messiah and the last three Festivals will be fulfilled by the Messiah’s Second Coming. famine and sword before “rockets fly”. 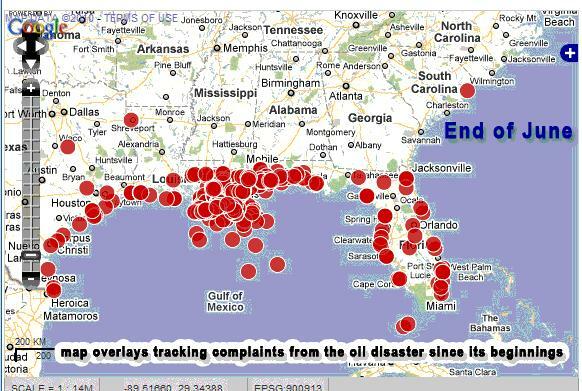 Connecting the dots pertaining to just how huge this ongoing oil spill really is. It is being greatly underplayed in the mainstream media just how catastrophic this problem really is…. This is probably the largest man-caused pollution in the history of the world and they have absolutely no proven way of solving the problem. Most of the ideas that are powerful enough to move the ocean floor enough to cover it back up would potentially make the problem much worse. They are literally frantically trying to INVENT a solution for this problem as the clock ticks and the fish die, the oil spreads and approaches the coasts and the ocean turns blood red..
[update The British Petroleum oil spill is threatening the entire eastern half of the North American continent with “total destruction,” reports say. An ominous report by Russia’s Ministry of Natural Resources warned of the impending disaster resulting from the British Petroleum (BP) oil and gas leak in the Gulf of Mexico, calling it the worst environmental catastrophe in all of human history, the European Union Times reported.